The 2016 Saint Joseph Grade School Auction, presented by Holladay Construction Group, took place October 22 in the new Parish Gymnasium! Thank you to all of our generous sponsors, donors, and volunteers! 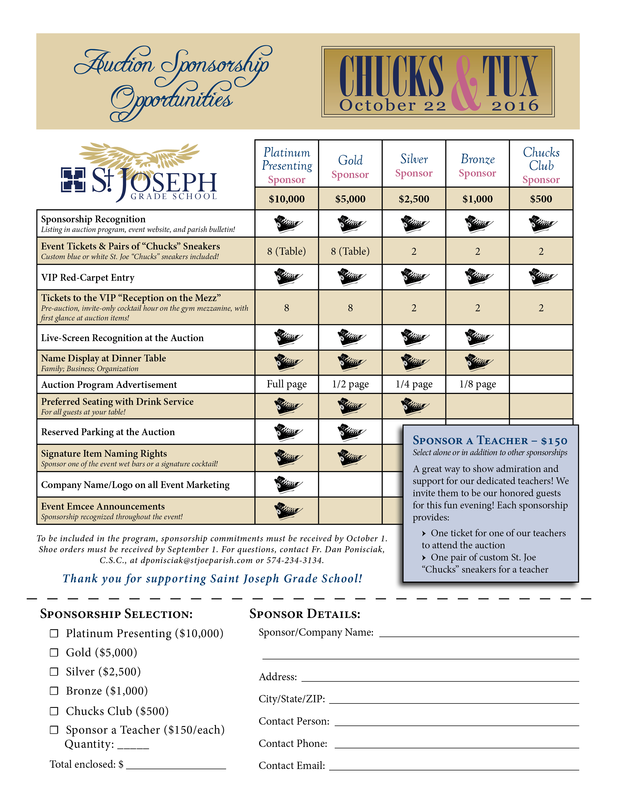 Saint Joseph Parish is proud to announce the 2016 Saint Joseph Grade School Auction, taking place October 22 in the new Parish Gymnasium! Our theme this year is "Chucks & Tux." Join us for a footloose, fancy, and fun evening of live and silent auctions to benefit Saint Joseph Grade School! In the spirit of the theme and this year's venue, suggested attire is "classy" dressy paired with "classic" sneakers. We are excited to offer an option to purchase custom made Converse Chuck Taylor All-Star (Chucks) sneakers, which feature a "St. Joe" embroidery on the back! For more information or to contact us with any questions, please see the links listed at the left. View our Sponsorship Form now! Contributions are being accepted now - see the Auction Wish List! Since 1854, Saint Joseph Grade School has been educating the hearts and minds of local children, with a commitment to academic excellence, Catholic faith development, and personal growth of our students. With hope and zeal, and with Christ as our model, we are a family of faith working together to enkindle in our students a desire to make God known, loved, and served. Our school, which enrolls over 500 students in preschool through 8th grade, was a 2011 recipient of the U.S. Department of Education’s National Blue Ribbon School Award, and has also been named a Four Star School by the State of Indiana each year from 2011 to 2015. The support of so many individuals and businesses in our community has been a critical component to this success, directly benefitting the children we serve. The funds raised at the auction are used for major school expenses, including staffing, curriculum, technology, and facilities needs. These dollars are vital to Saint Joseph Grade School as we further our mission and continue to be a leader of excellence in primary education.